I had so much fun working out the unusual construction of this shawl. When I say fun, let me qualify what sort – the sort of fun that comes from trying to puzzle something into existence that isn’t already a standard and isn’t immediately clear that it’s possible. I wanted a shawl with a jagged edge in a different colour that intersected with stripes travelling at a different angle and I didn’t want to use any sort of stranded colourwork or instarsia. I cut and folded a lot of pieces of paper (recycled envelopes from dismal bank statements, to be precise) to work out how to do it. Folding paper really helps me to understand how I need to manipulate stitches to get a particular shape. 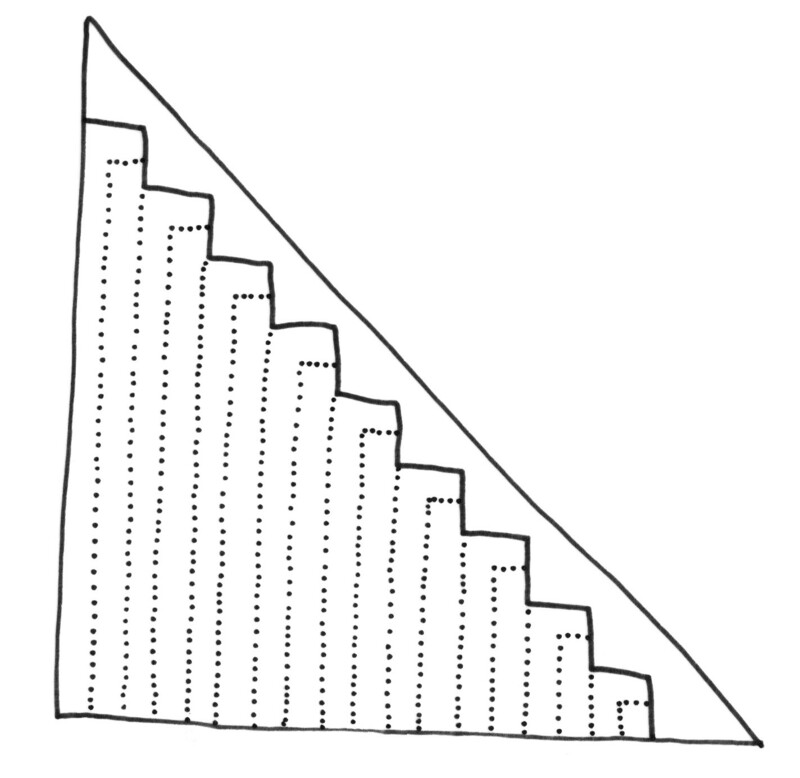 The shawl is triangular, made up of a series of descending steps created by mitred corners. The contrast edging hops along them for an extra-bright pop of colour in a zigzag of triangles that fills in the gaps between the steps. The shawl is knitted flat, in loose garter stitch, using three colours. The idea was that the construction would be entertaining to work while the garter stitch is very soothing. In what Stephen West has described as my signature move, I’ve placed eyelets at the transition between the two main colours. It’s a trick I picked up while learning machine knitting. 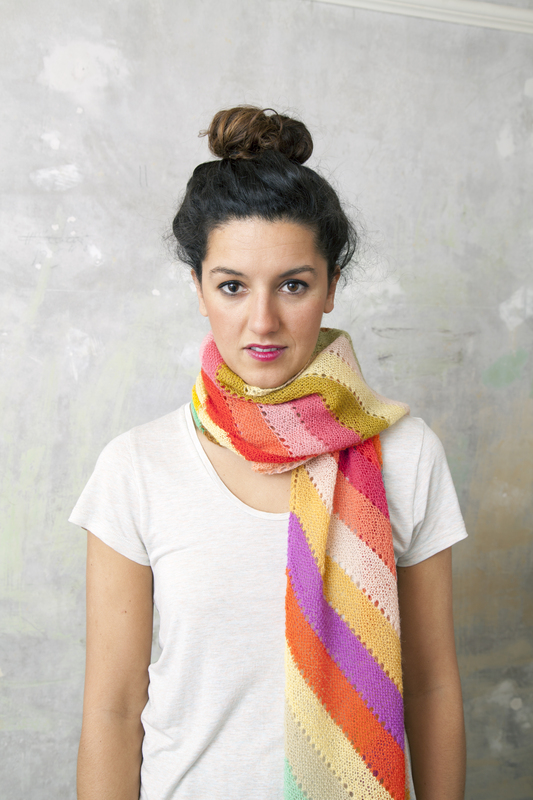 This technique perfectly disguises the change between colours, adding interest and making the shawl reversible. I’ve used it in both my Diagonapples (below) and Kermis patterns. The Rockhopper shawl is named after the rockhopper penguin, not the bicycle brand (though I imagine both penguin and bike were named after the fact they can hop between rocks). It comes in one nice big size. The joy of shawls is the flexibility of the yarn and tension you can work them in. You don’t have to work out what size will fit you and they tend to encourage people to throw caution to the wind and cast on without swatching. I’m a bit finicky with my tension and like it just so, even for garter stitch. On this occasion it needed to be quite loose to make it drape nicely and knit up quicker than a dense garter stitch. Garter stitch is always denser than a stocking stitch or lace, because of the way the rows snuggle together. I used 3 colours of Snældan 1-ply for the shawl pictured in the book. That’s equivalent to a laceweight, but not a superfine one. It’s a lovely mix of Faroese and Falkland wool, spun at the one mill on Faroe. I absolutely adore this yarn and am so happy The Island Wool Company stock it in the UK and supported me making this book. 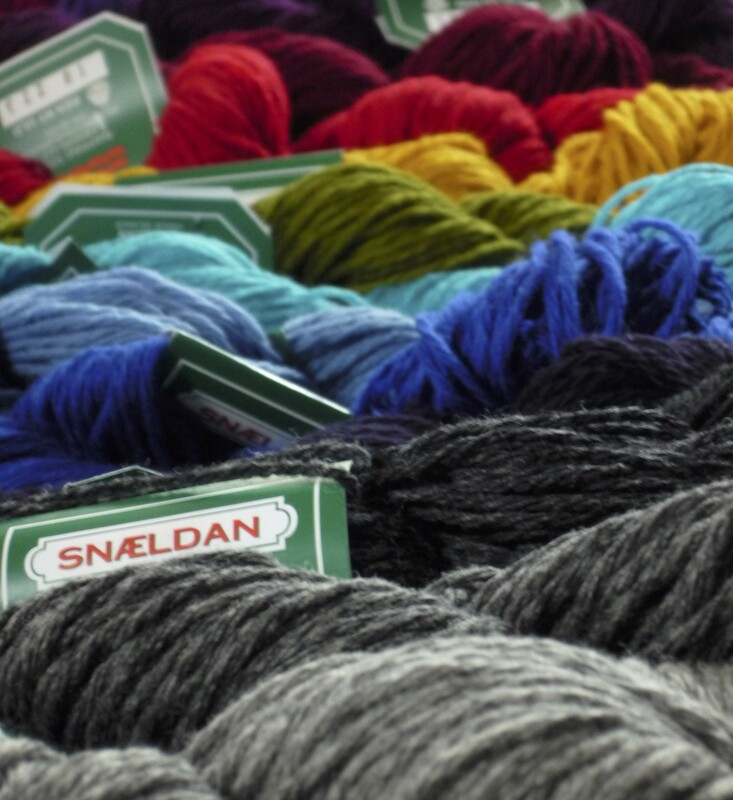 I know you shouldn’t judge a book by its cover and equally it’s wrong to judge a yarn by it’s label, but I love the fact that the Snældan labels have remained virtually unchanged since the company started in the 1940s. I know Karina Westermann is an equally big fan and designed her whole Doggerland collection using it. 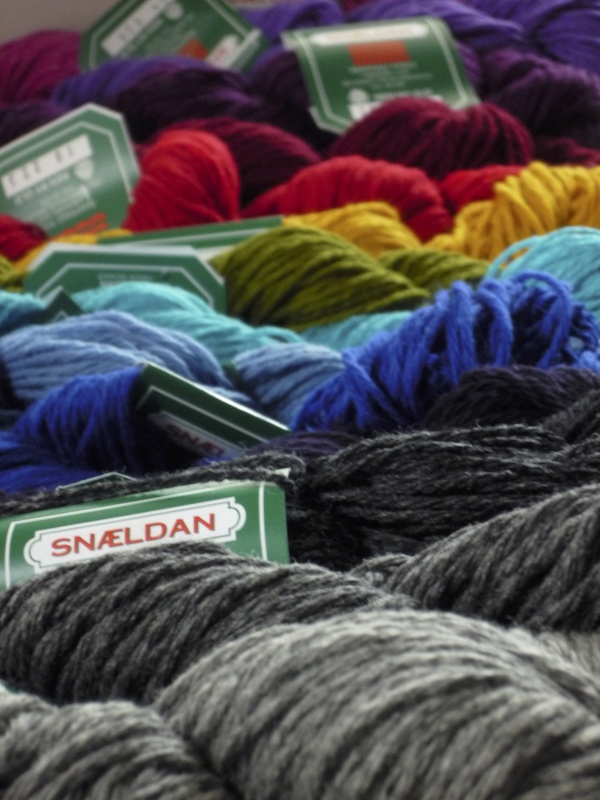 It’s good to note that the natural colours of Snældan are sold in 100g skeins which gives you 720m / 787yds and dyed colours in 50g skeins (so that gives you half the length). If substituting colours or yarns you will need about 380m / 415yds in colour A (that’s pictured in Charcoal), 350m / 382yds in colour B (pictured in Natural Fleece) and 200m / 219yds in colour C (pictured in Curry). 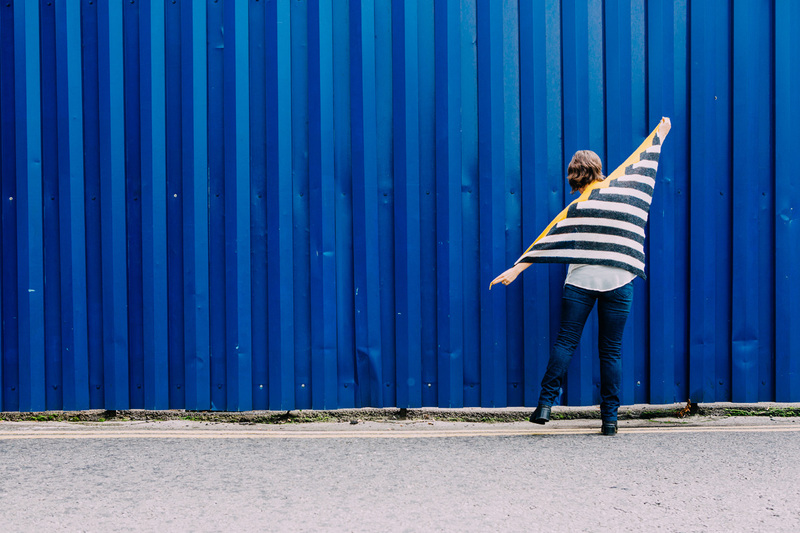 The Rockhopper shawl is one of 10 other patterns from Penguin: a Knit Collection – my new (and first) book. I’ve tried to pack it as full as possible with photographs, illustrations and stories, all inspired by penguins. You can find the Rockhopper pattern details on Ravelry and soon purchase it from your LYS (you might need to ask them to order it in, if they haven’t already arranged to stock it). 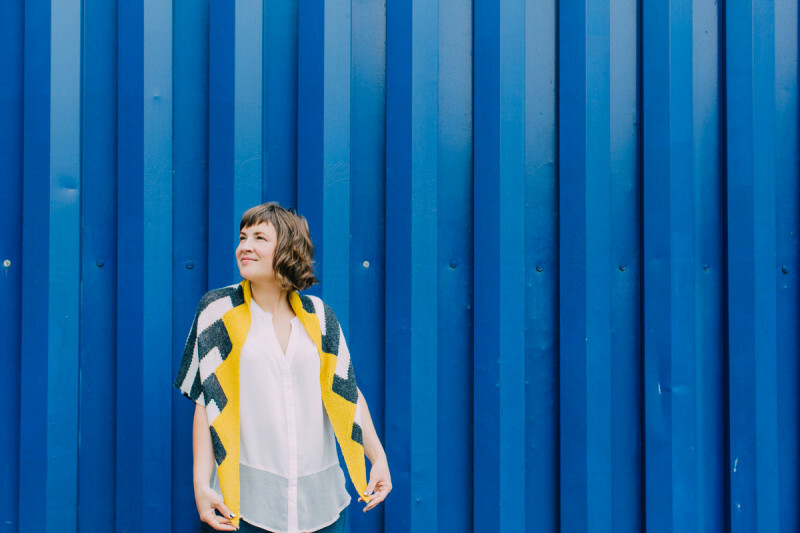 Get your copy of PENGUIN: A Knit Collection HERE!